Pentagon's report about the Intelligence power of Iran once again has created opportunity for Rajavi's gang to try to pose itself. Referring to the content of Pentagon report on Iran, remnants of Rajavi forge that they are the greatest and the most dangerous opposition of the Iranian government. Also, upon this report, MeK leadership makes effort to justify her accusations to some of the dissidents, to undermine their legitimacy and get rid of their disclosures especially about Rajavi's moral and sexual corruption. At first it should be noted that regardless of specific individuals named in the Pentagon report and their alleged relations with the Iranian government, which is raised unauthentic and ambiguous, the flow of defection from the MeK is accepted and believed by the world public opinion. More absurd than Rajavi's striving to eliminate dissidents is her scramble to prove existence of the terrorist group MEK. Pentagon's report and the like that in previous years, with any intention, occasionally have been broadcasted, contrary to the claims of Rajavi and her gang, not only are not signs of the Islamic Republic's breakup but prove authority of Iran and wholly mess up Rajavi's illusions. Interestingly, in none of American reports on the MeK - at least since the eighties - the group's alleged roots in the Iranian society or its social base are mentioned. Rather, what is brought up is Iranian intelligence system's confrontation with the Mek out of the country and its supposed utilization of dissidents of Rajavi. This indicates that even drafters of such reports are well aware that they are faced with a rootless and unimpressive group which is under tight control of information. Massoud Khodabandeh, from Middle East Strategy Consultants th book ‘The Life of Camp Ashraf – Mojahedin-e Khalq Victims of Many Masters’ to the Conference. The book places the MEK in the context of its foreign ownership and concludes that these owners have invested heavily in the MEK’s ability to commit acts of violence and terrorism, and that this is the reason for western resistance to closing the camp. The book particularly highlights the MEK’s refusal to allow residents of the camp to have contact with their immediate families as a fundamental human rights abuse of every person in the camp. The book was written primarily to give a voice to the people trapped inside Camp Ashraf and to their families who are camped outside waiting to find them and help them. Why these families are there at all is the big question and one which is fairly easy to answer. What is harder to answer is how to help them. The Mojahedin as a terrorist group is not a new problem for Iraq. 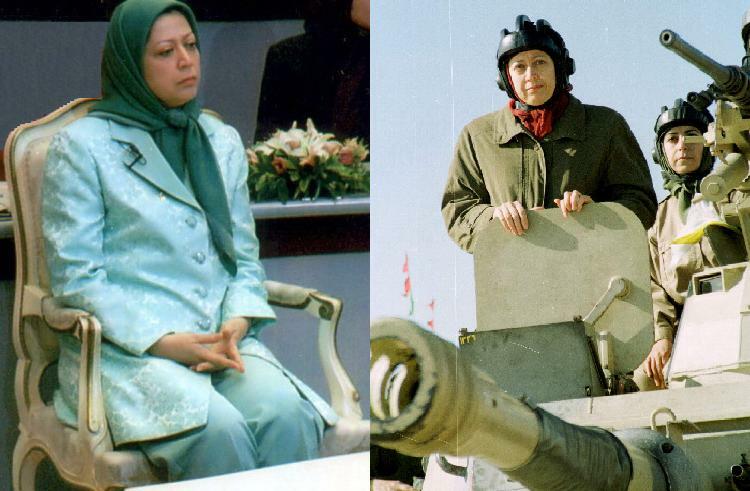 The MEK collaborated with Saddam Hussein to kill thousands of Iranians and Iraqi citizens. Unfortunately, after the invasion of 2003, the Americans failed to dismantle the camp and remove this terrorist entity from the country. So, the nation of Iraq is entitled to ask how did we end up here, nearing the end of the US military presence, but the terrorist cult they protected is still here? And the families of people trapped inside Camp Ashraf who are still outside the locked gates of the camp, desperate to find their loved ones, they are entitled to ask, why can we not meet with our relatives in peace and freedom after all these years? 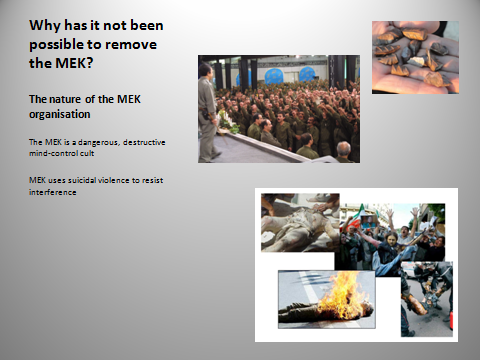 After 2003 there were some half-hearted efforts to deal with the MEK in the international political arena. For example, in Germany, Canada and Australia where action was taken by various state agencies to curtail the group’s illegal activities. 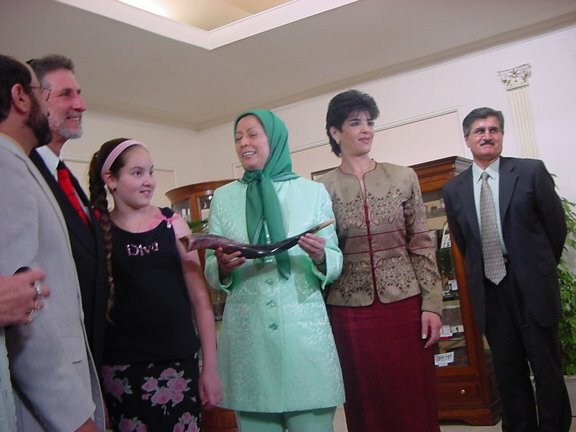 In France Maryam Rajavi was arrested in 2003 along with 150 others by counter-terrorism police. But when Maryam ordered her people to set fire to themselves the French Government gave in to the pressure and Rajavi is now free to continue promoting the European Union’s anti-Iran and anti-Iraq agenda. 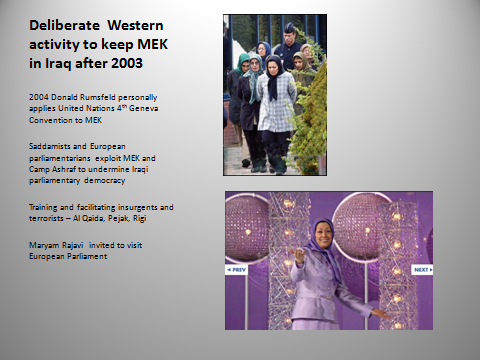 The covert Western political support for the terrorist MEK, which had been in place even before the fall of Saddam Hussein became overt after the 2003 invasion. In 2004 America deliberately protected Massoud Rajavi when then Secretary of Defense Donald Rumsfeld misapplied – against all logic - the UN Fourth Geneva Convention to the group. 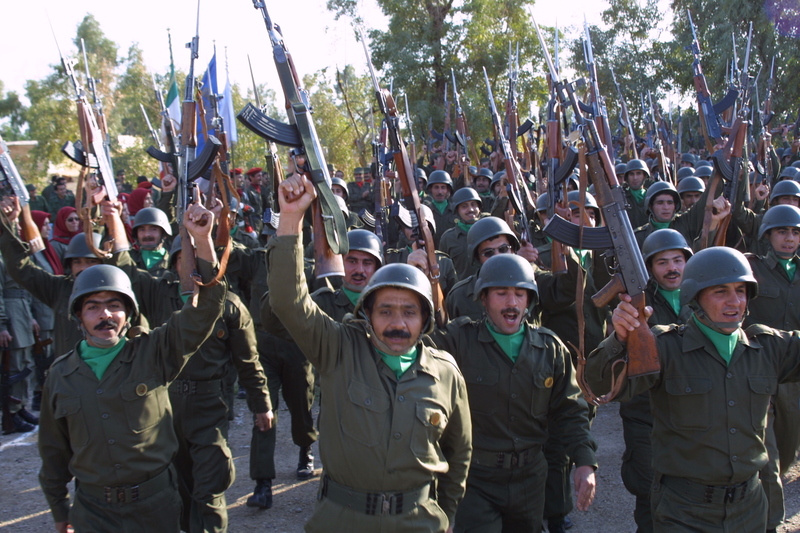 Designed to protect foreign civilians - the MEK were foreign but were certainly not civilians – the designation gave the MEK a free hand to continue its illegal and violent activities in Iraq on behalf of Rajavi’s Western masters, this time protected by American servicemen and women. America wanted and still wants to keep the MEK in spite of the facts. These facts were clearly described in both the 2005 Human Rights Watch report and the 2009 RAND Report. 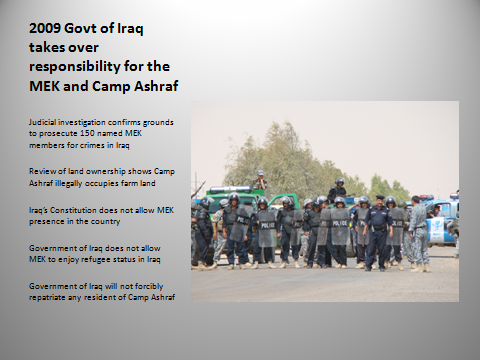 In 2009 the Americans were obliged under the terms of the Status of Forces Agreement to hand over control of Camp Ashraf and the people inside it to the democratically elected government of Iraq. It should have been possible at this stage to begin to deal properly with the group from a legal and moral point of view. Certainly, the Iraqi constitution does not allow the group to stay. Nor will Iraq allow the MEK to enjoy refugee status in the country because of the crimes committed against Iraqi citizens. The Iraqi Judiciary has confirmed it has grounds to prosecute at least 150 MEK members for such crimes. At the same time, the Government of Iraq has been clear that as well as being a terrorist organisation the MEK operates as a pernicious mind-control cult. 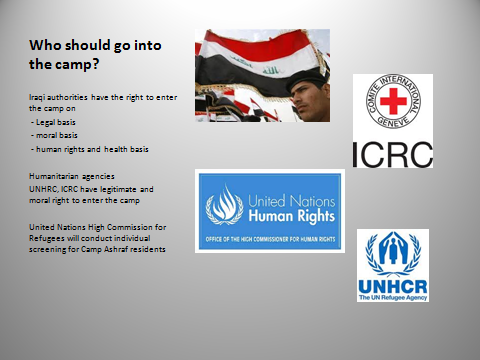 Because of this, all the Iraqi agencies and NGOs involved have been vehement in declaring that the human rights of Camp Ashraf residents must be protected and that Iraq will not repatriate anyone who does not wish to return home to Iran. But even after 2009, Rajavi was still refusing to obey Iraqi and international law. Iraq has been extremely patient and reasonable in the face of extreme provocation; what must be described as pre-planned and coordinated sucidal and violent resistance. Today the residents of Camp Ashraf find themselves with no protection and no refugee status and are also designated as terrorists in Iraq and America. So, if the MEK is so unwanted, why is it so difficult to get rid of them? There are two reasons. One is the nature of the MEK itself, and the other is the role of external agencies in preventing Iraq from expelling the group. First let us look at the MEK itself. On both occasions when Iraqi security forces attempted to impose law on the camp, Rajavi ordered his followers to kill themselves in his defence. Some victims were shot by the MEK, some threw themselves under Iraqi vehicles. The message from Rajavi was clear – come near the camp and I will kill everyone in it. 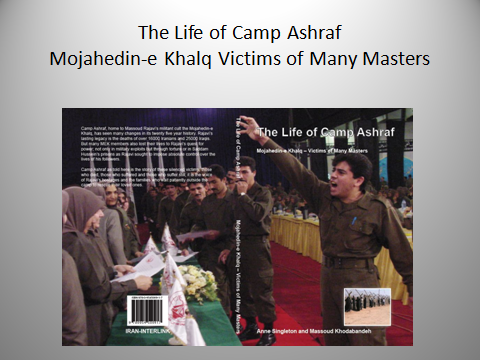 The book ‘The Life of Camp Ashraf’ explains with detailed evidence that this is no ordinary group. It is a dangerous, destructive mind control cult. Without getting too deep into explaining what this means, basically they brainwash and exploit the members to the point they have no will of their own and will obey the leader without question, even if this means killing themselves to order. 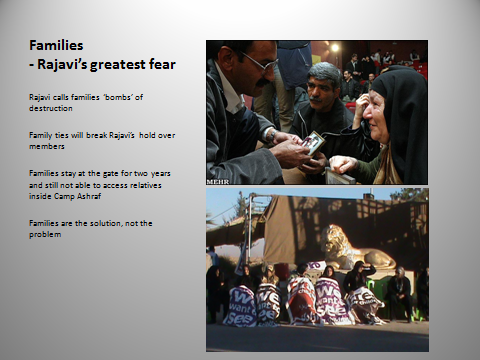 Rajavi has trapped the members inside the camp – physically and mentally. The gates to the camp are locked from inside. The perimeter fence is reinforced from inside. Residents are made to believe they will be killed by Iraqi soldiers if they try to escape or if they survive they will be sent to Iran to be tortured and executed. Iraq’s government understands what it is dealing with. 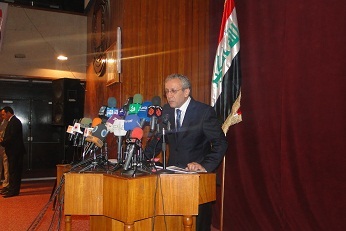 Iraq’s problem is that other external parties do not see the group in the same way. The international community (US and EU) have clearly sided with the cult leader for their own political gains. The biggest favour Iraq could do for America and Europe now is to become involved in the mass deaths of the MEK. That way the West would be rid of the problem and could still point the finger at Iraq and say ‘what savages, how inhuman you people are’. But Iraq will not fall for that trick. Clearly, it is the unwarranted western political support for the MEK leaders which prevents the rescue of the camp’s residents. 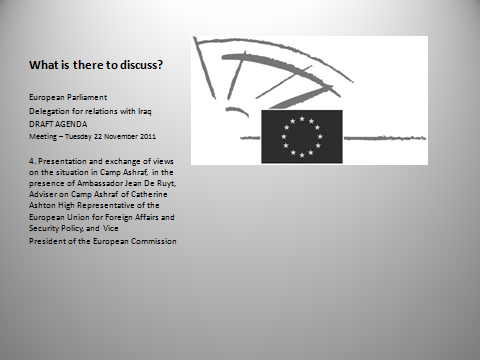 In a meeting of the Iraq Delegation on November 22, what did the European Parliament chose to talk about in relation to Iraq? While Iraq has all kinds of issues, trade links, reconstruction, security, health, social and religious issues which could be discussed, the only item on the agenda was the MEK and how to protect them. The MEK killed 25,000 Iraqis. What is there to talk about? Two major questions remain – how to get in and who should go in? The United Nations High Commission for Refugees has agreed to go into the camp to interview residents individually for refugee status. So far they have not succeeded. Unfortunately, if external agencies don’t understand the cult nature of the MEK they will fall into the trap of manipulative lies and deception. Certainly, the biggest deception must be exposed. Rajavi does not represent the hostages. He is the hostage taker – therefore neither he nor his minions are able to negotiate on behalf of the 3500 people trapped inside. Until it is possible to go into the camp and speak individually to the residents without MEK oversight it is not possible to say what should happen to them. At this moment, nobody knows how many of the residents remain loyal to Rajavi. 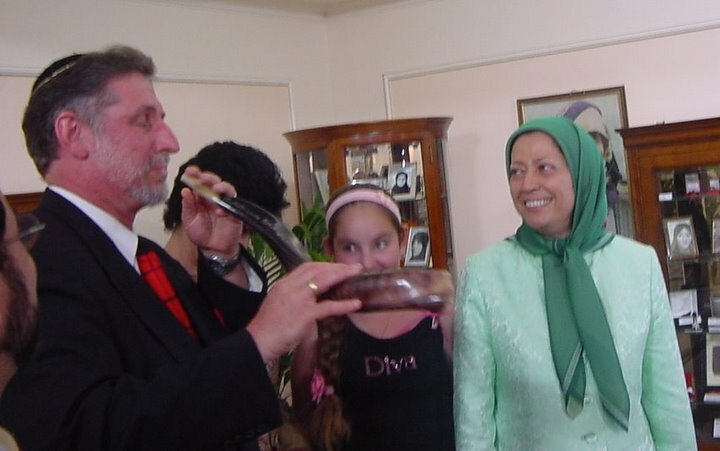 From the testimonies of recent escapees – from all levels of the organisation – we can estimate that only five or ten percent of the residents in the camp are loyal to Rajavi. This means that everyone else is being kept there against their will. For this reason Iraq’s Human Rights Ministry has been insistent that it is necessary to get inside the camp to protect the residents against the abuses of those leaders. Once this simple fact has been recognised it will become clear that the key to opening the gate of Camp Ashraf is to involve the families of the people inside. Why? Because this is Rajavi’s greatest fear. How do we know this? Rajavi has deliberately separated the MEK from all relationships with mother, father, sister, brother, husband or wife or child. Rajavi knows that once a member re-discovers the love and affection of their family and friends, they will abandon him forever. A wonderful example of this is Mahmoud Rostami who escaped the camp two months ago. Rostami was a Prisoner of War in Iraq and was deceived into joining the MEK. He had not seen his family for twenty two years. 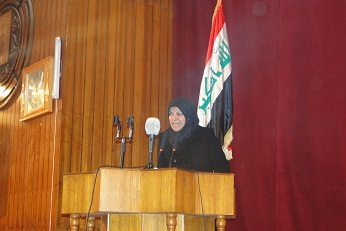 Rostami’s mother visited Camp Ashraf three times. Hearing his mother’s voice over the loudspeakers finally brought Rostami back to reality. When Rostami also heard the other family members crying out to their loved ones his humanity was re-awakened. 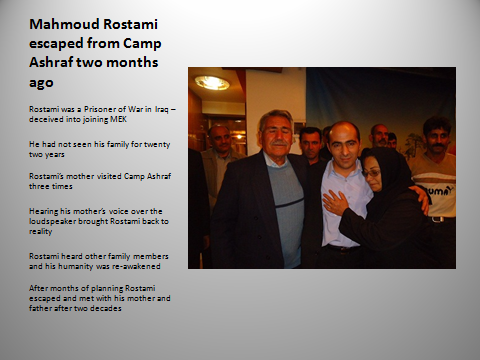 After months of planning Rostami escaped and met with his mother and father after two decades of forced separation. 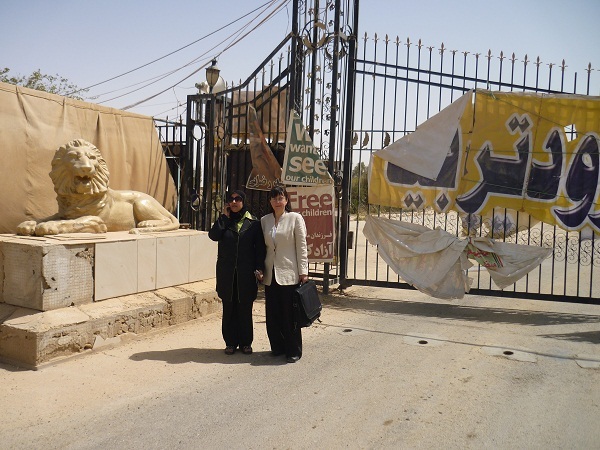 There can be no legitimate or moral objections to opening the gate of Camp Ashraf to allow people to go inside; whether family members or humanitarian agencies. This has nothing to do with the Iraqi timetable to evacuate Camp Ashraf. It is a purely humanitarian gesture. The only barrier is the leader Massoud Rajavi and his second-in-command Maryam Rajavi who refuse to do the right thing. Of course, there must be a proper framework if those inside are to be accorded effective help. United Nations interviews should be supplemented by visits from cult experts and family members or representatives of the families of residents. Each person interviewed must be given information about their rights and their possible future steps. The families have no political agenda, they come in a spirit of love and concern to rescue their loved ones. They are there to help the residents. Families are the key to opening the locked gates of Camp Ashraf and opening the locked hearts of the imprisoned residents. The families are the solution, not the problem. 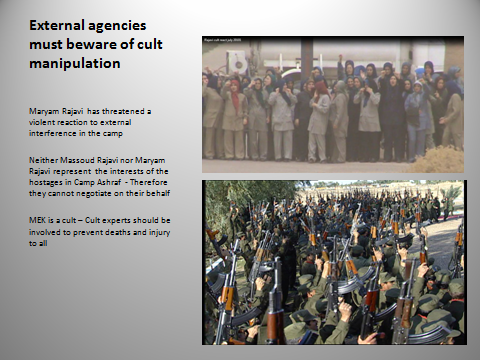 As the Mojahedin-e Khalq (aka; MEK, MKO) is painfully slowly being nudged toward compliance with both international and Iraqi law over its activities inside Camp Ashraf in Iraq, cult experts warn that external agencies must be wary of falling foul of cultic manipulation techniques as the group struggles to maintain its hold over the 3400 Iranians trapped inside. Efforts over the summer by US Ambassador Lawrence Butler to convince the MEK leader Massoud Rajavi that he would have to act on the Government of Iraq’s deadline to leave Iraq by the end of 2011, yielded little progress. MEK front personnel still refused to allow any residents to be interviewed by UNHCR staff without MEK minders being present. Then by the end of September Vincent Cochetel, a Washington representative for the UN High Commissioner for Refugees (UNHCR), said that an agreement had been reached through the MKO’s legal counsel in London for individual screening for refugee status with the UNHCR offering an alternative location near Ashraf for those who have been processed. Maryam Rajavi immediately qualified this news from her HQ in France with the Farsi language diktat: “… we will not allow the line of the mercenaries Maliki and Barezani and the strategy of their masters, the Iranian regime, to prevail under the pretext of interviewing people one by one and …” and she continued “… all the Mojahedin members should only be taken for interviews using helicopters …” – which meant that in order to interview the people trapped in the camp she expected the US to fly over seven thousand helicopter sorties. Such statements are plainly silly and we should not imagine that either Massoud or Maryam Rajavi expect anyone to take them seriously. They are meant first and foremost for internal consumption and as a time wasting exercise. Such a stance is reminiscent of the time when the MEK’s London lawyers announced in English that the group had given up armed struggle in order to be removed from the UK and EU terrorism lists. At the same time Rajavi told her followers in Farsi that as soon as the MEK was de-listed the Americans would re-arm them and they could continue with their violent activities. The latest salvo from the MEK’s armoury of lies and deception was introduced in the form of an MEK claim that over seventy Iraqi MPs have called for the UNHCR to open an office inside Camp Ashraf and take over control of the camp from the Iraqi government. This comes at the same time that Alsumeria News has reported that a British parliamentary group headed by Baroness Nicholson is discussing with a visiting Iraqi parliamentary delegation headed by Mr. Alnajifi to find way to actually get access to the inside of the camp. The Government of Iraq is very clear that it is dealing with the phenomenon of a dangerous, destructive mind control cult. Unfortunately, Western agencies do not appear to have got to grips with this fundamental aspect of the group and as such continue to fall under the spell of the MEK leaders and their unearthly and insatiable demands. It would be unfortunate in the extreme if the UNHCR did not understand during all its negotiations with the group’s front personnel that Massoud Rajavi does not represent anyone but himself and his own interests. Cult experts warn that the MEK are not seriously offering to allow the UNHCR to open an office inside Camp Ashraf in order to conduct individual screening and processing with a view to removing the residents. The most the MEK could hope for is that the UN will, for any reason, raise its flag over the camp beside or in place of the Iraqi flag which is currently there. Raising the UNHCR flag over the camp over which the Iraqis themselves have no jurisdiction would of course be extremely provocative, a challenge to the rule of law and cause conflict between external agencies and the Iraqi security forces. Exactly the kind of scenario which the MEK would love to create so the MEK leader continues with impunity to occupy the camp and hold hostages there. 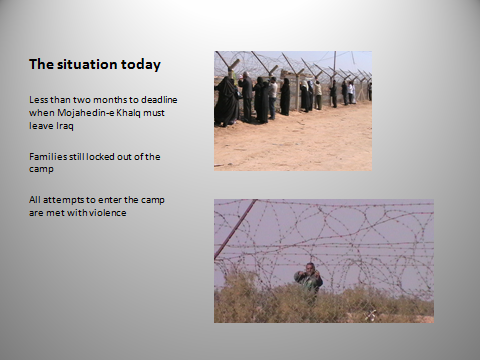 We are approaching the end of year 2011; the deadline announced by the Iraqi government to evacuate Camp Ashraf. Over the past few months the USG’s diplomatic representative in Iraq Mr. Lawrence Butler has met seven times with the leaders of the Mojahedin-e Khalq Organisation in the garrison to talk about the future of the group. His efforts have failed due to the stubborn resistance and rejection on the part of the Mojahedin-e Khalq. Some European countries have also have attempted to start a dialogue with the leaders of the group to convince them to allow the people inside to be sent individually to other countries under the supervision of the United Nations. But their efforts have also faced absolute intransigence on the part of the leaders of the group. In addition, we have witnessed UN Secretary General Ban Ki-moon appealing to the international community to help the Iraqi government in this case. But no meaningful action has been offered. The people inside the camp are described as “non status” and they are not accepted as refugees or even asylum seekers. The Iraqi government is adamant it will carry out the decision to close the camp - which is one of the last remains of the Saddam regime - and on the other hand the leaders of the Mojahedin inside the camp insist on keeping the status quo without any logical, legitimate, legal or other reasons. And in this situation, as advocates of human rights and as ex-members of this organisation, we are deeply concerned about how this camp will be dismantled and especially about the misuse of the people inside the camp by the leaders of the group. Considering what the Rajavis have said, although we believe that the imposition of Iraqi sovereignty over this illegally occupied territory at this time is an indisputable right of the government of Iraq, we urge the government and the committee in charge of dismantlement of the camp to try, as they have done over the last past 8 years, to only use non-violent solutions to solve this problem. Although we know that the existence of this camp in this country of Iraq has no logical or legal basis but we are concerned that the heads of the MEK cult will use the 3400+ people stranded there as human shields to pursue their illogical and illegal demands. We are deeply concerned that, according to much evidence and many documents, not least the report by the RAND Institute, about 70% of the people inside the camp are kept there against their will, and if we add to this their loss of hope due to the grim and uncertain future they face, the lack of access to media and information and the resulting ignorance this brings, and the existence of never ending barriers and security provisions across the camp, if we add all these then the reasons behind the existence of such an isolated island can become clear. We are deeply concerned that in a situation where the dismantlement of the camp has begun, the leader of the group would force the low level members and the ordinary people trapped inside to fight the security and law enforcement agencies of Iraq. On top of our concern over the human rights as an indisputable right for every individual inside the camp we remind you that many of the signatories of this letter have a family member, father, mother, spouse, sibling or friend inside the camp as a hostage. Therefore the primary aim of the MEK in keeping the members trapped inside is nothing except using them as a tool and human shield to save the neck of the leader Massoud Rajavi who remains in Iraq. We warn that considering that the leaders of the group have already rejected the intervention of the Americans and insist on the relocation of the whole organisation as a group to another country, while it is clear that according to international law, asylum can only be given to individuals, the leaders are placing this kind of suggestion on the table only to further reject any non-violent solution and therefore exploit the members and endanger their lives. We must warn the international community and humanitarian organisations across the globe, time is running out. And we are witnessing that the US proposal is the only feasible and realistic solution during the remaining time. Therefore while we condemn the leaders of the group for their lack of cooperation with the American and Iraqi officials, we warn that the responsibility for any resistance to the decision of the Iraqi government and endangering the lives of the people is primarily on the shoulders of Massoud Rajavi and Maryam Rajavi and the other high ranking leaders of the group. The government of Iraq has repeatedly announced that, respecting international humanitarian laws, these people will not be deported to countries where they may face problems and it has shown its commitment to this day. Accommodating and facilitating the voluntary exit from the camp of nearly 100 individuals who have given themselves up to the Iraqi forces from 2009 to the present is clear evidence of this commitment. Therefore we ask the international community and humanitarian organisations and all the people who are worried about the future of these people to use whatever communication and/or other tools at their disposal to convince the leaders of the group that after the fall of Saddam Hussein Iraq is no longer a place for them to stay and it is their responsibility to seek assistance from international bodies such as the ICRC and UNHCR to get themselves out of there. It is interesting and entirely predictable that at the same time you replied to Iran that the six major powers - the United States, Britain, France, Germany, China and Russia - are willing to meet within weeks if Iran is prepared to "engage seriously in meaningful discussions" over concerns about its nuclear programme, we have seen a flurry of activity by the Mojahedin-e Khalq (MEK) to skew perceptions of the issue with misinformation and self-aggrandising propaganda. Paid MEK activists held yet another demonstration in front of the White House on Saturday with the irrelevant demand that the US government remove the MEK from its terrorism list. In Brussels Maryam Rajavi, wife of the MEK’s leader, was given a platform to promote terrorism in the European Parliament. Conflating the totally irrelevant issue of Camp Ashraf in Iraq with the problems posed by Iran’s nuclear programme and the MEK’s terrorist listing in the US, she was given a platform to verbally attack and insult Iraqis and their elected government from a parliamentary building. The MEK is certainly highly proficient in advertising itself as a tool for anti-Iran elements to use and it is unfortunate that Europe’s corridors of power are being so casually exploited to promote Washington’s favourite terrorists. The intended signal is that Europe will brandish a stick to open negotiations with Iran over the nuclear issue. Does the European Commission represent European interests in this respect or do you represent the agenda of only the extreme right wings of USA and Israeli politics? But as much as we believe this is against your interests, these are political issues and we do not wish to take any position in this respect. Our first and foremost concern is that you do not allow the issue of Camp Ashraf and its sick and aging population to be used as a political football for everyone to kick around for their own game. It has been reported that Mrs Rajavi conveyed her thanks to you for taking the side of the MEK against the government of Iraq. If this is true it is highly unfortunate that your office has been manipulated to look as though you are taking a position of backing the head of a terrorist cult instead of the victims. 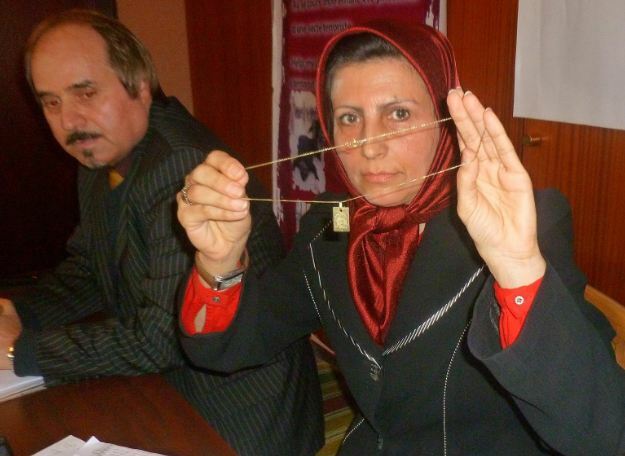 Mrs Rajavi like her fugitive husband Massoud Rajavi does not represent the individuals trapped inside Camp Ashraf. The Rajavis do not represent anybody’s interests but their own. 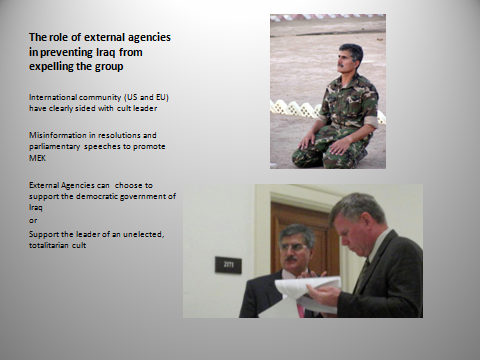 The Government of Iraq has frequently advised representatives of the European Union not to use the MEK to push their agendas in Iraq, to the point of issuing written and verbal complaints against interference in the internal affairs of their country, including their elections, and have warned against using elements of terrorism to push their agendas. However, these political issues must be addressed in another arena by other parties. 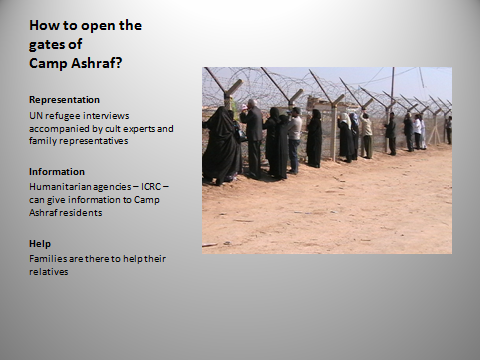 We are specifically interested that you have now taken responsibility for dealing with Camp Ashraf. As you are aware, around 3400 Iranian individuals remain trapped in a dangerous, destructive mind control cult, the Mojahedin-e Khalq, by its leader Massoud Rajavi inside Camp Ashraf in Diayla province of Iraq. Since the MEK was confined to and protected in the camp by the US military in 2003, Rajavi has resisted all efforts to allow any external agencies to free these individuals in a peaceful and humane manner. Rajavi is holding the residents as hostages to guarantee his safe future, to avoid prosecution for war crimes and crimes against humanity brought against him by the government of Iraq and the international community. You are also aware that since February 2009, many of the families of these hostages have taken turns to stay just outside the camp in an effort to find and meet their loved ones and to prevent the MEK from further harming them. Now, as a new contingent of families from Gilan province in Iran have arrived at the camp, we are writing to you on behalf of the families of the captives of the MEK and its Western backers in Washington, London and Brussels. (Such ordinary Iranians find themselves voiceless in Western political and media circles due to the virulently anti-Iranian attitude which prevails in these circles.) They wish first and foremost to remind you that they are part of the solution, not the problem. You have demonstrated your particular interest in this issue by appointing Mr Jean De Ruyt, a former Belgian ambassador to the EU, as your advisor on Camp Ashraf. He will no doubt be investigating and examining whatever approaches are available to resolve the situation. By situation I refer to the standoff between the constitutional and legal demand of the elected government of the sovereign nation of Iraq, and the illegal and irrational demands of a cult leader as the hostage taker who represents nobody but his own interests and who is prepared to kill others to this end. The government of Iraq demands that the MEK leave Iraq before the end of the year, certainly before American troops are withdrawn. For this reason, there is an urgent need to find an effective solution. 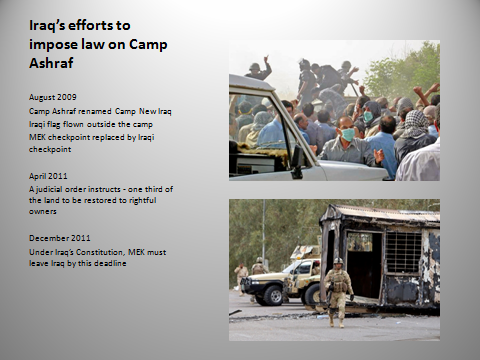 On two occasions, August 2009 and April 2011, when Iraqi security forces have attempted to enter the camp to impose the rule of law on the camp, Massoud Rajavi ordered his special forces, his fedayeen, to force the brainwashed residents to confront these efforts with a suicidal resistance which led to the deaths and injuries of many rank and file members as well as injuries to Iraqi security forces. Iraq is working hard to avoid a similar confrontation in future and is expecting cooperation from the international community in this respect. Soon after the second of these incidents I visited the camp and interviewed the responsible authorities and gathered enough evidence which is available for any party who would like to know. Since 2008 three reports have described the situation of the camp and two books have been written on the subject. Mr Jean De Ruyt, who will liaise with EU states and organizations including the United Nations, says that a peaceful and realistic solution and the security and safety of residents are his priority. For this reason the families are very optimistic now that you have taken over responsibility from the Americans. With the appointment of this advisor the families now believe your office has a mandate to help Iraq, the UN and ICRC to resolve the situation as soon as possible. The families are asking that you coordinate with the Iraqi authorities to help them to protect their relatives when the leaders are finally forced to open the gate of the camp and allow external agencies in. This is the first step before the UNHCR can take the residents out of the garrison and interview them individually without MEK minders present. It is at this time of maximum confrontation that they fear Massoud Rajavi will order the deaths of the residents. Once the gates of the camp are finally opened safely, the residents will of course be able to access the facts and information which have been denied them for decades about their true situation and the possibilities for their future. Whatever their choices, their families are on hand to offer them protection and support. 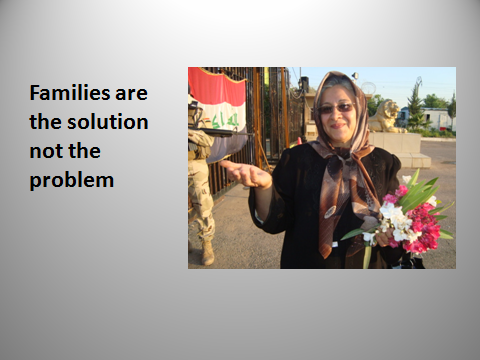 Of course, not all the families can be in Iraq at the same time, but all are willing to travel there to help their loved ones when their individual circumstances demand. Considering that the US military has deliberately helped the MEK to keep the gates closed and the residents trapped inside, the opportunity now exists for you to act as a go-between for the US and MEK and thus ensure that the camp is opened up at the earliest opportunity so that work can start to relocate the hostages. Certainly the government of Iraq is happy to help facilitate this outcome on the understanding that if this process is not begun by the end of the year, the international community has obliged them to take unilateral decisions regarding the camp and its residents. Above all else, the families outside have travelled from far and wide to rescue their loved ones and are more than happy to ensure a swift and peaceful outcome. There can be no possible objection or obstacles to helping them.